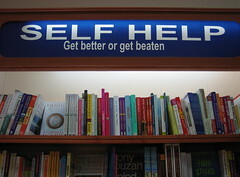 Self-help books have become so popular that the New York Times no longer includes them in the list of Nonfiction Bestsellers – they created the new category of Advice. The separate list shows us that self-help books are not only popular, they are numerous. They are often top-choices at the public library, and a trip to a used book store reveals that people read them, perhaps try the new method for a while, then discard one and go on to the next. According to investigative reporter Steve Salerno, in his 2005 book Sham: How the Self-Help Movement Made America Helpless , Americans spend $8 billion a year on self-help books. Market researchers help the supposed experts package their message so that it generates repeat clientele. Salerno asks why, if self-help books solve people’s problems, do people have to keep buying them? Salerno points to junk science and vacuous advice. I think there’s a deeper reason. It’s a rare thing for a person to identify a problem in her life without having any ideas of something that would lead to some improvement. But the methods that have demonstrated success tend to share a few characteristics: they require self-discipline over a period of time, they take effort, and they are generally boring or require work. Everyone knows that exercise has a positive impact on everything from heart health to depression, that troubled relationships require work to resolve and a lot of forbearance and forgiveness, that we are happier when our lives have structure and time for leisure, and so on. We buy the self-help books in hopes of finding an easier, softer way – something that will supply the self-control or motivation or forgiveness without having to change so much. The proverb points to the futility of seeking this external wisdom until we have found the strength, mind, and heart to follow wisdom where she leads.